7/30 Cup of Coffee: Greenville and Salem delivered the system's only wins on the final Sunday in July. Darwinzon Hernandez continues his recent surge, turning in another strong start supported by Brett Netzer and the Salem offense. Greenville completed its sweep of Charleston as it maintains its spot in first place in the second-half standings after a dreadful start to 2018. 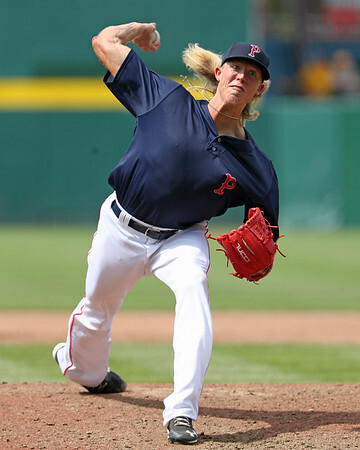 Despite Pawtucket losing in a rout, it featured perhaps the most notable happening of the day, as Jordan Weems (pictured) made his Triple-A debut seven years and two positions after the Red Sox made him their third-round pick in the ballyhooed 2011 draft. The Knights plated runs in each of the first five innings on a tough afternoon for the PawSox. A string of five consecutive quality starts for William Cuevas came to a halt, as the Pawtucket starter allowed seven runs (five earned) in four innings. Jordan Weems, drafted back in 2011, made his long-awaited Pawtucket debut in relief. Weems surrendered one run on two hits in his three innings of work. After toiling for several years in the system as a catcher, Weems has impressed since converting to the mound in 2016. The 25-year-old righty has a 3.59 ERA and more than a strikeout per inning across three levels. Mike Shawaryn pitched out a series of jams to turn in another solid start. Seven of the nine hits allowed by the right-hander were singles, and he struck out four against just one walk in six innings. He allowed three runs (two earned), and lowered his ERA to 3.28. Trey Ball made his return from an eventful trip to the disabled list that included a round of batting practice that kicked off speculation about the 2013 first-round pick's future. The left-hander was in his familiar place on the mound Sunday, as he allowed a run on three hits in two innings. Josh Ockimey went deep for Portland, his 14th of the season. Austin Rei doubled and tripled, and Chad De La Guerra picked up a pair of hits. It was a solid outing for Darwinzon Hernandez, backed by an 11-hit effort by the offense. Hernandez went five innings, allowing two runs on five hits, with seven strikeouts against just two walks. The only major issue for Hernandez was his efficiency, as he needed 97 pitches to complete those six innings. Brett Netzer was a catalyst, picking up two hits and reaching on a hit by pitch. Tyler Hill also picked up a pair of hits, while Jerry Downs and Chris Madera connected on home runs. It was the 10th round-tripper of the season for Downs. The Drive completed the sweep of their cross-state rivals to cling to their second-half lead in the South Atlantic League's Southern Division. Hildemaro Requena allowed just one run on six hits in six innings to earn the win. Durbin Feltman continued his impressive pro debut, with a strikeout in a scoreless inning of relief. Tanner Nishioka and Zack Sterry ripped three hits apiece, and Samuel Miranda drove in two runs out of the ninth spot in the order. It was a tough afternoon for Lowell, who dropped its fifth straight and seventh of its last eight. Trey Ganns was a bright spot at the plate, breaking out of an 0-for-15 skid with a two-hit day that included a double. Brian Brown turned in another solid outing with two scoreless innings featuring a pair of strikeouts. Brown, Boston's ninth-round pick last month, has a 2.35 ERA in 30 2/3 innings. Player of the Day: It was a long road to Pawtucket for the 111th overall pick in the 2011 draft. After signing a $500,000 bonus as a cannon-armed catcher out of Columbus (GA) High School on July 26th of that year, Jordan Weems saw other members of his draft class rocket through the minor leagues. It was not to be as a catcher, however, as he saw his bat stall out, and made a last-ditch effort in 2016 to revive his career by converting the mound. Now 25, it is Weems' turn to rocket through the organization, now just a step away from the major leagues as he check off his third level of the 2018 season.